STILLEN has been offering carbon ceramic brake rotor upgrades for the Nissan GT-R for several years. The 2012(US) Nissan GT-R upgraded the front brake rotors from 380mm to 390 mm, but went thinner from 34 mm to 32.8 mm. The STILLEN/AP Racing CCM brake upgrade includes 400 mm x 34 mm front rotors, and 400 mm x 30 mm rear rotors. As a set, the CCM's are 38 pounds lighter than the factory rotors and hats. 38 pounds of rotating, unsprung weight. DSport Magazine recently put a set of CCM's on their R35, as part of an entire package of weight loss, and exhibited it at the 2011 SEMA show. Once found only on the world’s most expensive supercars, Carbon-Ceramic Matrix (CCM) brakes have been developed for the first specifically-tuned aftermarket application – the Nissan R35 GT-R. These 400mm disc assemblies are 20mm larger than the standard 380mm OE iron discs, yet reduce weight by nearly half. This is rotating and unsprung weight, leading to improvements in all performance categories: acceleration, handling and braking. Who uses these ultimate CCM discs? The most up-to-date version is found on the Koenigsegg CCX and McLaren MP4-12C. 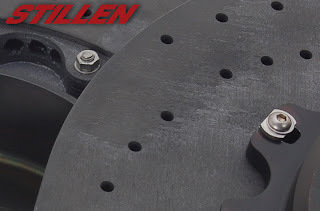 And now - STILLEN and AP Racing have optimized a specific set for your R35 GT-R and its factory brake calipers.